UK's Lowest Price. The Orbit 3 allows unattended duplication of up to 100 discs at a time. 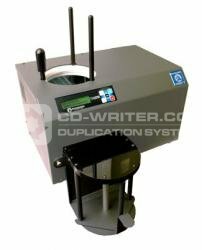 Featuring Microboards' patented disc singulation technology, 100 CDs or DVDs can be placed into the Orbit 3 at a time. The dual-drive system writes two discs simultaneously at top speeds of 48X CD and 18X DVD. The Orbit 3 stores successful discs in a spindled output bin while automatically ejecting rejected discs. The Orbit 3 also comes complete with HDD for multiple image archiving. Micro . Orbit . 3 . DVD . Duplicator . MicroBoards .